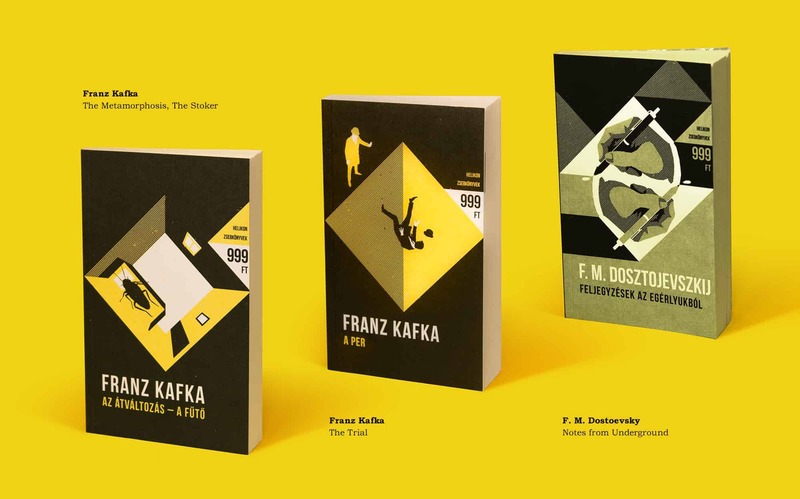 I was commissioned by Helikon – a Hungarian Publisher – to design the identity and the covers of a 40+ piece book series called the Helikon Pocket Books. This was planned as a low budget series from the start with less than 3 euros for each book. There were only two restrictions set by the publisher, one was to place the series’ name and the price on the front covers, and the second (out of cost-effectiveness) was the duotone printing. The main challenge was to come up with a strong visual language that could tie together a whole range of books. You can find Alice’s Adventures, Sherlock stories, japanese poems and philosophical titles in the series. After a short layout phase I came up with the diamond shape and the five tonal levels, and all that provided a strict gridline that made it easy to work upon. Beside the illustrated covers there’s an additional drawing on the back that also reflects on the story of each book. The heavily textured, uncoated paper was an obvious choice that gave the books a “warm” touch and it also echoes the visual style. I used mostly Photoshop and for a small part like the endpaper and the diagonal lines Illustrator. The team at Helikon liked my previous work and gave me total creative freedom. It was a rare case that I only had to provide three initial layouts in the end and one of them was approved in an instant. Whenever I start working on a new cover the first thing to do is to understand the main message of the given title and it is the same with the Helikon series. When we have an approved sketch (with a color we feel fitting for the subject) I make a high-res version. The only tricky part in the whole process is to end up with two channel PSD/EPS files that are suitable for duotone printing. So I have to separate everything in groups: the color layers, the black layers and sometimes the white layers. If I’m doing it right, at the end I only have to flatten the groups and copy&paste them into a proper two channel file. I know it sounds more complicated than it is, but it’s really straightforward once you get a grasp on it. I believe this is a unique project and I’m glad that people are responded so positively – it’s been awhile since reading and buying books was considered to be a hip thing. I’ve been lucky enough to do a lot of great projects during my freelancing years but this was the most complex and yet the most fun so far. The main thing I learned that I really enjoy planning and designing series and groups of images! Once you set the basic rules it is a truly entertaining process to come up with similar yet unique group of images. Rather nice looking series, though a bit sterile. O the other hand, what a shatteringly moronic idea to put the price on the cover, and in big font, at that. As if the stupid buyer – so infinitely engineerable psychologically with the 999 gimmick – wouldn’t find it on the back.